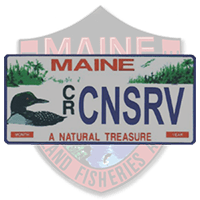 In the early 1990s, Maine's legislature established the Conservation Registration Plate [Loon Plate] as an additional source of funding for Maine's nongame and endangered and threatened wildlife. The Endangered and Nongame Wildlife Fund [ENWF] - a dedicated, interest-bearing account, which is supported by the Loon Conservation Registration Plate, is running out of money and needs your help! In 1998, the ENWF received a high of $617,484 in contributions, but by 2009 contributions had declined by nearly 50% to $316,148. With more license plate options available to motorists, many Mainers are choosing alternatives to the Loon Plate. A 50% decline in Loon Plate sales threatens matching federal dollars and puts in peril several wildlife biologist positions at the Department of Inland Fisheries and Wildlife. We live in Maine because of its vast outdoors and its wide variety of fish and wildlife. Please support the program that protects what we love - the Endangered and Nongame Wildlife Fund. Thanks to participating motorists, peregrine falcons now nest on an array of cliffs in Maine, and bald eagles once on the brink of extinction in the state were removed from Maine's list of Endangered and Threatened Species in 2009. These are two of the many examples of work done to conserve Maine's special wildlife diversity including amphibians, reptiles, breeding birds, owls, shorebirds, nesting seabirds, harlequin ducks, dragonflies, damselflies, salt marsh birds, wading birds, grassland birds, freshwater mussels, bats, black terns, and Canada lynx. The Loon Plate also provides funds to make improvements to Maine's state parks. $20 for first time buyers; $15 to renew, plus regular registration fees. Vanity plates with up to five characters are an additional charge. Loon Plates are available at Bureau of Motor Vehicles or designated town offices. After processing fees, $5.60 from the sale of each plate supports the Endangered and Nongame Wildlife Fund managed by the Maine Department of Inland Fisheries and Wildlife, and $8.40 supports the Maine Department of Conservation's Bureau of Parks and Lands. The Maine Department of Inland Fisheries and Wildlife accepts donations to the Endangered and Nongame Wildlife Fund. Make your on-line tax-deductible donation to a worthy cause. All monetary gifts are deposited into a special, interest-bearing account from which money only can be spent on the conservation of Maine's endangered and nongame species. To make a donation by mail, please make checks payable to: Treasurer, State of Maine and write Endangered and Nongame Wildlife Fund in the "memo" section of your check. Mail your donation to: Wildlife Division, Maine Department of Inland Fisheries and Wildlife, State House Station #41, 284 State Street, Augusta, ME, 04333.